I love the 3D Warehouse and I’ve ranted about its greatness in a previous post, when I decided to upload some of my own 3D models to this glorious library of 3D components. You can view my entire collection of 3D models here. I don’t want to sound ungrateful but I’ve stumbled upon a slight problem. You see, when I’ve downloaded models from the 3D Warehouse, I’ve spotted (quite frequently) that organic or rounded models which were created initially using the Circle tool or the Arc tool have edges, when there should be none. 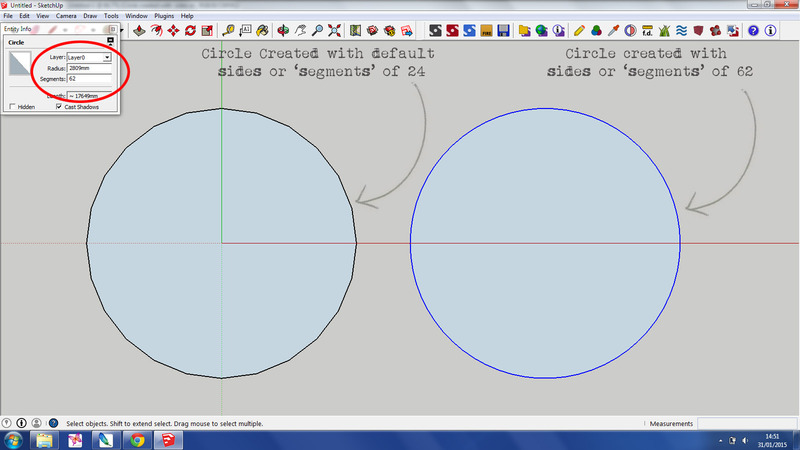 Circles in SketchUp are actually constructed using a series of connected straight lines. 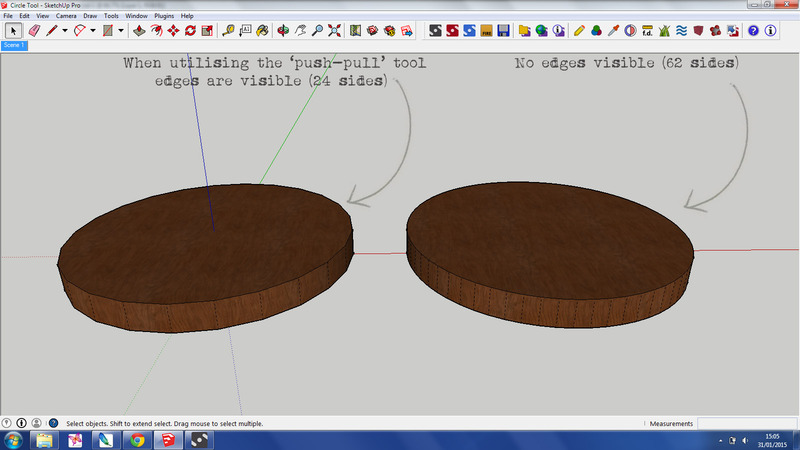 Below are two circles I created in SketchUp, you can clearly see the straight edges in the circle to the left. This circle consists of 24 sides or ‘segments’. 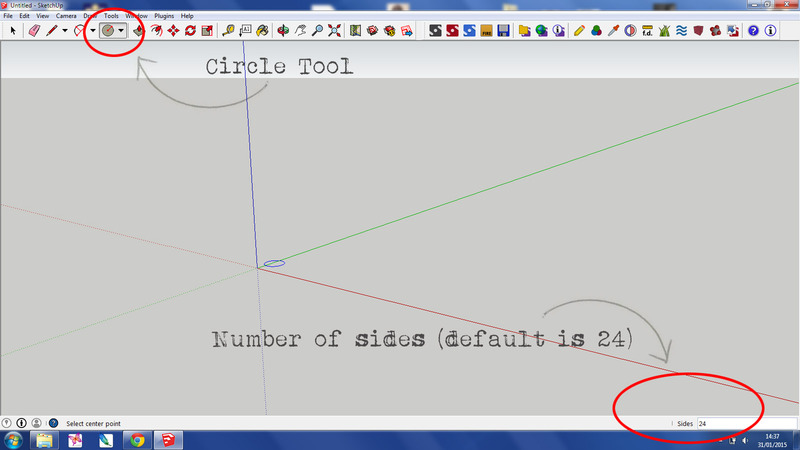 Circles in SketchUp are created using 24 segments by default. In order to create a more fluid circle that DOESN’T have obvious edges, you need to edit the default setting. The circle to the right, has been created using 62 segments and you can clearly see that it appears much more smooth and fluid. 1. Once you’ve drawn a circle, click on its edge (it will become highlighted in blue, as below), then go to: Window, Entity Info and the section entitled Segments. Here you can change the number of segments from 24 to whatever your preference is. Or you can use the shortcut key: draw your circle, type the number of segments in the measurements toolbar followed by the letter ‘s’ and press ‘enter’. 2. Or you can specify the number of segments BEFORE you draw the circle. You’ll notice in the bottom right hand corner of the image below, the word ‘Sides’ beside the measurements toolbar and a figure of 24. Edit this number before you draw the circle. It’s important to note that you CANNOT edit the number of segments once the circle has become 3D geometry!!! You MUST edit the number of segments BEFORE you manipulate the circle. I’ve used the Push-Pull tool on the circles above and this is how they appear once they’ve become 3D geometry. You can clearly see that the 3D object to the left has edges, whereas the model on the right has none. 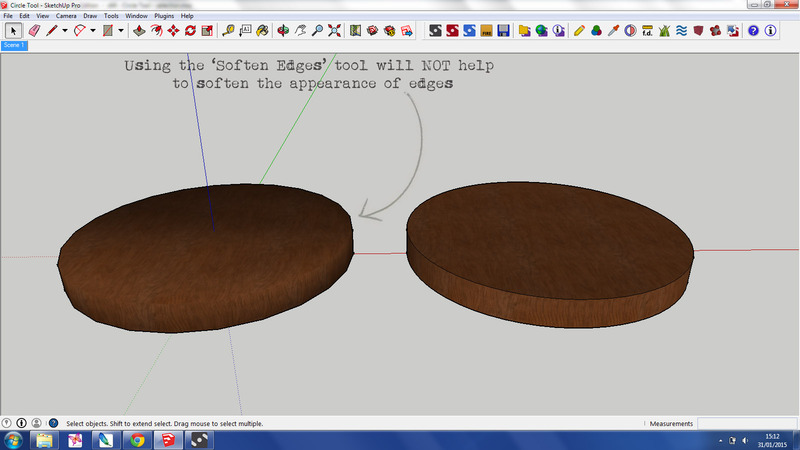 Selecting the Soften Edges tool will NOT correct this, as shown below. This also applies to the construction of spheres in SketchUp. 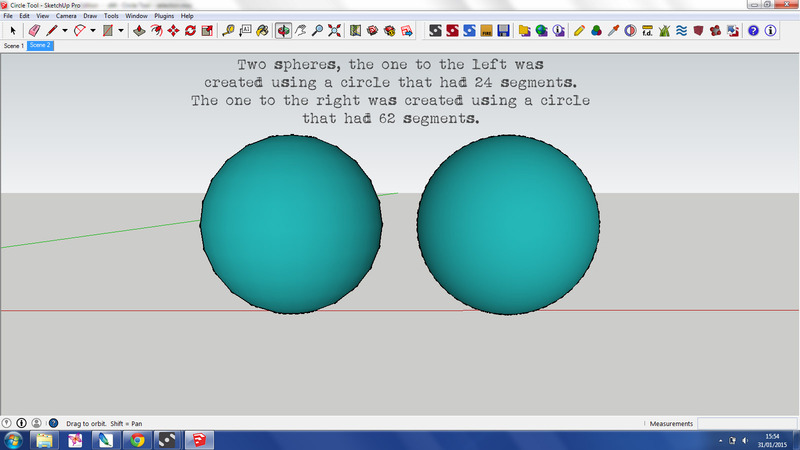 Here’s two spheres that were created initially using circles (and the Follow Me tool). Not editing the initial number of segments causes further problems when trying to render 3D models (especially for close-up shots), where the objects should be smooth/rounded, and are not. This also has implications in relation to reflections and shadows cast. Here’s a quick render of the above 3D models. The ability to edit the number of segments in SketchUp was something I was told quite a while ago (very kindly) by a fellow SketchUpper and I thought it might be useful to write a blog post about it, considering a lot of models in the 3D Warehouse that I’ve seen in recent months have had organic geometry but unfortunately the segments weren’t edited (initially) to ensure a smooth and rounded overall shape. Your right about never using the default number of sides. A higher number is preferred. However you should use 64 sides not 62. Trevor, thank you for clarifying! Thank you Anita, I don’t use many circles in my models, but I didn’t know this function. So now, they will be slightly more smoothy. Thank you for taking the time to comment. I’m glad you found it useful! Trevor’s suggestion is a good one. I always try to keep the number of sides to a multiple of 12, partly for that reason. They are then also even divisible by 2, 3, and 6. While increasing the number of sides makes smoother looking results, there is a point of diminishing returns. There’s no need to go crazy with the number of sides. And you should make wise choices about the number of sides you use taking into consideration the apparent size of the geometry in the overall model. For example, a round table top should certainly be drawn with more than the default 24-sided circle. But a small hole such as for a finger pull in a drawer front doesn’t need more than 24 sides unless you are going to make a close up image of it. You should also take into consideration that increasing the number of sides reduces their length. You can get to a point where the sides are so short that SketchUp won’t create the faces. This will require extra steps to form the shape. Try drawing a sphere with a radius of 1 cm using 64-sided circles for both the profile shape and the path. And you should also consider the intended use for the model or component. Maybe it makes sense to keep the number of sides down on curves to keep the components “lightweight” so they don’t bog down the model. If that round table is shown in a large overall view of a cafeteria, maybe 24 sides on the top is fine. Thanks for your input, Dave! Great advice, as always. My biggest issue where organic/circular geometry is concerned, is how it will be appear once rendered. Sometimes, even if the component isn’t close up in the final render, the lighting will highlight certain edges that really have a detrimental effect on the realism of the overall scene. So I guess, all aspects of the final rendered image need to be considered when creating organic/circular geometry. Every time I restart Sketchup, it resizes all cirlces back to 24 sides. How can I force it to remember that I want 96 for everything please? I want to change default for startup. Hi Paul, I don’t think it’s possible to change the default number of segments for a circle. That’s probably because you shouldn’t need to use the same number of segments for every single circle or arc that you draw, in a new 3D model. It’s very much dependent on what you’re modeling at that time. If you have been able to change the default, let me know!